Simon Starling is a web weaver. He’s an artist who works with the materiality of connecting threads. A builder of scaffolds into which the architecture of his artwork constructs itself. Material narratives take the driving seat in his work, guiding the way in which the objects come to life in the gallery. For some, the background stories to the objects and processes complicate the work in a negative way. Too many convoluted twists and neat counterpoints, too many explanatory words needed in catalogues and wall labels. Yet for others, myself included, these complexities add richness and texture, and allow concept and material to interweave together in a network of relations that honours both equally. Three White Desks is a story made manifest in household furniture. 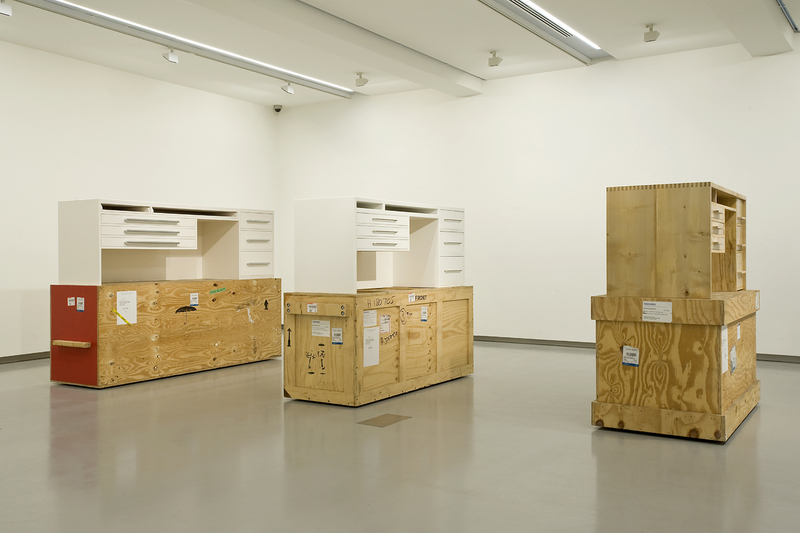 The use of transport crates as plinths allows the narrative to transfigure itself as materiality, and to deliver and support the more recognisably material art objects. Starling commissioned a German cabinet maker to produce a copy of a desk that was designed by artist Francis Bacon for Australian writer Patrick White. A hi-res 30MB image was sent to the maker as reference. The German cabinet maker then used his mobile phone to send a lo-res photo of the desk he made to a second cabinet maker in Sydney, who then made a version of the desk based on that photo. When the Sydney cabinet maker finished making his version, he emailed a medium-res photo of it to a third cabinet-maker in London who made the final copy. The three desks are presented in the gallery, each one atop its own delivery crate, together with an oil painting by Roy de Maistre (who assisted the young Francis Bacon in acquiring commissions for his furniture and interior designs, and was Patrick White’s lover), and a large print containing images of the desk in situ and other related artworks and interiors. The background becomes the foreground and the ideas become objects. But in light of this the material objects do not slip away, they are not merely tokens of a well-told story. The desks are indeed copies and yet they are more material in the context of the gallery than the original, which is trapped as an image inside a frame on the wall and inside the words of the story that carries the idea. The gradual devolution of an original in the hands of three geographically dispersed professional craftsmen brings weight to the forms. There’s degradation in the form of the desk without degradation in the quality of ‘a’ desk. The particular degenerates to a particular. Echoes reverberate and then harmonise. Linearity gives way to circularity. This sort of methodology is present throughout the rest of the exhibition, with each gallery devoted to a singular networked web of woven stories and material objects. A spiral staircase made of steel is the supporting mechanism for a large film projector that casts images of the factory where the support was made. The film feeds up and down the bannister columns of the staircase, is in fact the bannister columns, and not unlike the double helix of DNA containing the coded data of the entity it proposes to construct or is constructed within. In another room a model airplane made of balsa sits in front of a large photograph of forest. The airplane was made for a flight on the grounds of Heide II, in Melbourne, using wood sourced from Ecuador, and serves as a messenger carrying threads from Le Corbusier, to indigenous canoe-making, to anthropological theories of migration. It stands as a symbol of the artist himself, the messenger god Hermes, giving character and substance to connections. Weighting the relationships between things with the gravity afforded objects. 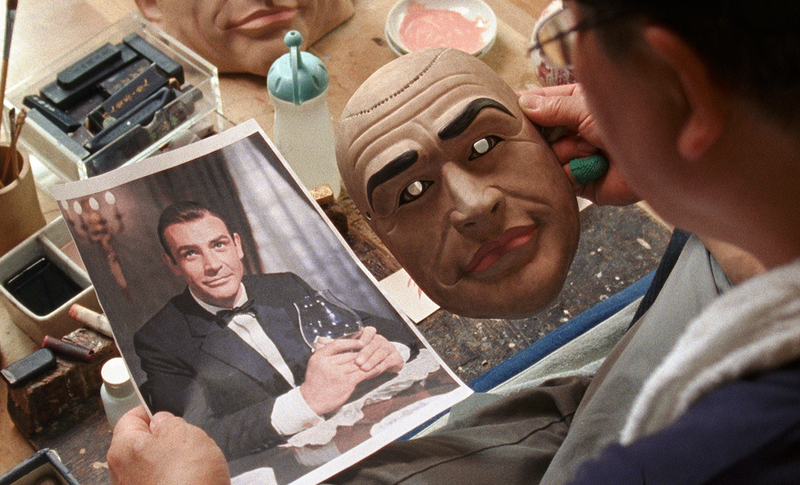 A delightful film weaves a narrative starring a specific actor (Sean Connery) playing a non-particular character (James Bond), the modernist sculptor Henry Moore, the semi-fictional Colonel Sanders and an historically important uranium tycoon called Thomas Hirschhorn, all via the onscreen documentation of a Japanese master mask maker. Convex mirrors recast the passage of Venus across the sun in a passageway allowing external vistas to the open gardens and by the time you exit the exhibition you feel like you’ve come full circle through a lagoon of whirlpools. Amazing stuff and a wonderful opportunity to see this acclaimed artist’s work. Tags: MUMA, Simon Starling. Bookmark the permalink.